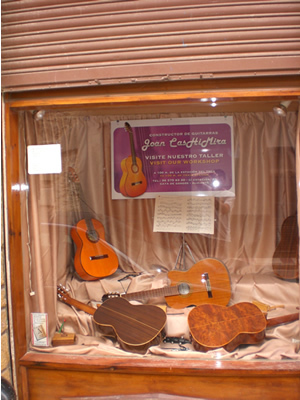 There are lots of day trips you can take when you are in Javea - and one that is well worth the while whether you have a musician in the family or not is to the guitar factory in Gata de Gorgos, about 9 km from Javea. I should make clear that there is no obligation to buy - they are really friendly and very passionate about what they do and happy just to show people round. Obviously when you get this close to such craftmanship there is a great temptation to buy and I guess they don't do badly! If I had a couple of hundred euros to spare when I visited there is no question, one of their guitars would have been coming home with me! I didn't know they did guitars like this but you can get classical Spanish guitars - no surprise there - but narrow bodied - really narrow - almost like a semi-acoustic electric. 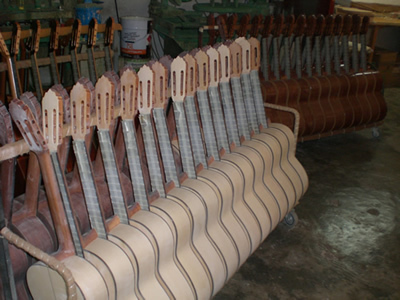 These are designed for the coolest flamenco players but get an amazing amount of resonance from a very narrow body. I've never seen them anywhere else and would have bought one except I already had the guitar I had brought over with me to take home. There are distinct sections to the factory - where everything is done by hand I should add - and the process begins with them wetting the wood and wrapping it round the moulds. The inside supports to give it strength are fitted - and strips are also placed on the underside of the soundboard to channel the sound. 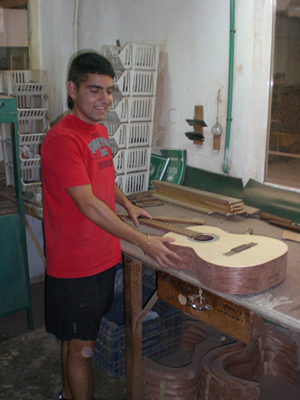 Then they tie the top, bottom and sides of the guitar with string and let it dry. One fact I didn't know - and if you have an acoustic guitar in the house go and check now - the top of your guitar (where the soundhole is) is actually made up of two pieces of wood glued together in the middle. I've been playing guitar twenty years and I never knew that - doh! 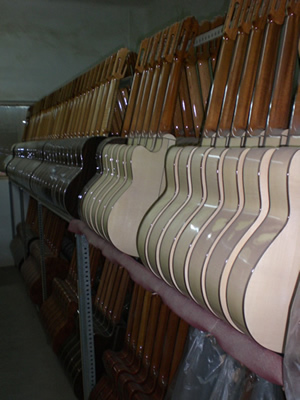 After the guitars are dried they are painted. When dry they go to assembly where things are added like tuning pegs. Then come the frets which are simply angled pieces of metal banged into the fretboard with a hammer, by hand. The bridge is attached, the guitar polished and varnished and finally the strings are attached and it is road tested. Our guide was a charming and enthusiastic guitar maker called Danni. Full of information and passion for his craft - he was brilliant - and kept the kids and me well informed and entertained. He even showed us the office parrot. Prices seemed to be pretty reasonable and you could walk away with a very nice hand-made guitar for just a couple of hundred euros. Well worth a trip. Opening hours are Monday to Friday 9-1 and 3-7. For a detailed map of how to get there click on this link. It takes you to their website. What I would say is - when you get in to Gata - you will go along the main street full of wicker basket shops (the town's other speciaility) - keep going, turn left just before you get out of town and head to the railway tracks. As you drive towards the railway tracks you will see on your left a street with a no entry sign - look in the sky and you should see the guitar sign on your left. Now you know where the street is - head to the train tracks do a left, a left and probably another left and you will be there. Or simply use the google map which I hope displays below. They can be contacted on 659 962 481.